The range of stuff they have,you can kit out your whole family and house from there.And the value of course! What a great prize! I love penneys because they have really nice fashionable on trend items at an affordable price! I love (especially in the past year) how up to date Penneys are with the style of clothes they sell. Even if I'm not 100% on Peplum I'm still in there for a gander!! Puggs! Penneys Uggs, I have so many pairs and I LOVE them. I always have frozen feet and they're a godsend! I love the dresses they sell, they always have fab dresses that are so affordable & I can never leave Penneys without checking out their scarves... they always have lovely scarves! Happy Blog Birthday! Really adore Penneys for their affordable accessories. Super. The prices! I don't know what I'd have in my wardrobe if Penneys didn't exist! Fluffy socks and fleecey tights!! Roll on Winter! Love Penneys! i love that they always have cheaper option of trends. I hate spending loads of money on a trend piece only for it to go out of fashion in a few months! At least with Penneys you can still be on trend and not worry about not being able to wear the pieces in a few months because they were so cheap! i love how I can kit the whole family out for summer/winter and never seem to spend more than €150!! I love how beautiful the shop looks at christmas time, it is sure to put me in the mood for christmas! Love how they are always on trend! Am especially loving all the woolly winter clothes!! I am no longer allowed near the essence I seem to come home with 10 bottles of nail varnish every time!!! It's going to be the pyjamas oh and the long cardigans! I'm from the sticks so basically getting to a Penneys is rare but always pleasurable!! The prices! Love how it's getting better and better all the time, too. The ability to always be on trend and look great for a fraction of the price!! The value and the clothes being very on-trend! I love being able to take my teenage daughter shopping and have her feel she's been on a proper spree without emptying my wallet! I love the sheer amount of things I can get for €50!! I love that Penneys has constantly changing stock! You could go in every week of any season and come out with completely different pieces! eveything the choice the price!! Ah Penneys, I love how after a [insert bad word here] day at work, you can just pop in and purchase a wee pick me up-cute frock for €15, pair of boots or even just an Essence nail varnish. You can buy happiness for less than €2! the quality and price, it can't be beaten, I even use their mousse foundation, a steal at €3!! Love Penneys -- trendy pieces and great prices, for all the family. Great prize, happy birthday lovelygirliebits! i'm off to penneys today to get me a fur jacket! I have a dress that I paid 7 quid for in Penneys 3 years ago and it still gets a regular run out of the wardrobe. It's the finds like that that make me love Penneys! EVERYTHIN... up todate fashion, gr8 prices, loads of sizes, gr8 for kids too, ive a teenage boy and young girls and i can dress them all from litterally head to toe and still be able to dress myself and hubby!!! Love Penneys. So much choice for so little money. I love penneys because it alwas has the latest styles and has something for everyone! Really want to update my winter wardrobe with a trip to Penneys - I'm thinking coloured skinnies and winter woolies! I love how you can leave the tills with HUGE bags full of stuff and only have spent €50!! Love Penneys, easy on the pocket. Good quality clothes at affordable prices! As well as all the scarves they have,can barely go in without buying another! Heaing in on a Friday afternoon and picking up something that's on trend for that night. Great selection, value, trendy,interesting fashion for me, the family and our home all in Penneys, the one stop shop for value! Pennys is a firm favourite in our household. Choice and value - unbeatable ! I LOVE PENNEYS because their fashion and prices are unbeatable and are a great Irish success story! Pennies is my absolute FAVOURITE! 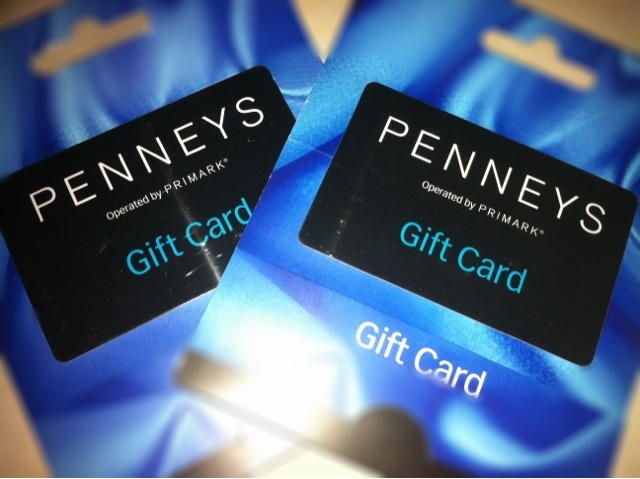 I love penneys simply because of their value! Penneys means style and affordability to me. Well done Penneys. To adaptquote an apt song "Penneys are from heaven " ! especially if you are a hard pressed fashionista - Budget Chic since the start. I love their selection of Essence! The random accessories like their wigs and unusual jewellery! Great fashion and style at a very affordable prize. Also great bargains to be got when you visit any of their stores. I love Penney's prices and style! Everything - from pj's to earrings - its the best shop EVER!!!! you're such a doll penny! love it! I love their jewellery! Cheap and Cheerful! I love how they have nice clothes - including jeans that fit perfectly, and their insanely cheap prices! The range and the price! I love Penneys, especially for basics! I love penny's because the do my face bronzer tights and fab clothes under one roof if love something I love being able o buy it in more than one colour! If you're looking for the basics or something far out - they have it. Brilliant for the kids fashion.